Jan 9 Was that a Willet? 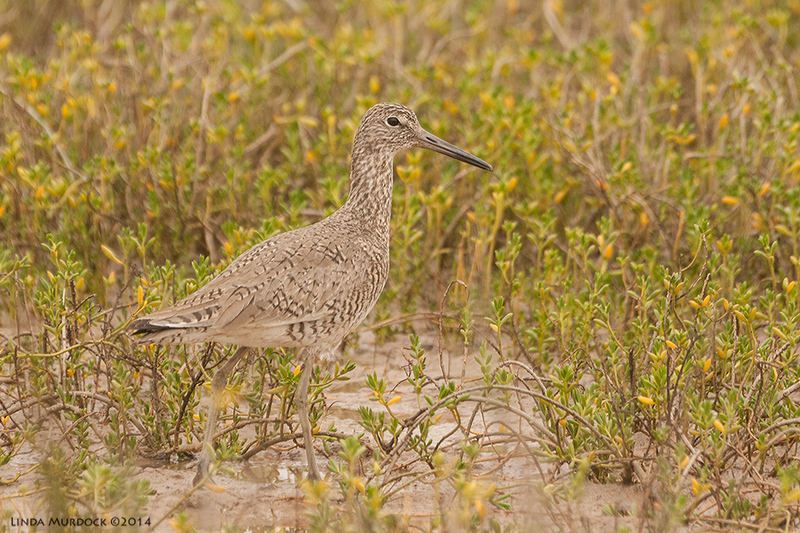 The most common shorebird on the Gulf Coast is the Willet. And truthfully, it isn't a bad looking bird, especially in flight. But bobbing around the shore line, Willets don't do very much .I tend to identify Willets just to rule out something more interesting, such as a Marbled Godwit or Greater Yellowlegs. But all that is about to change! The Willet is going to get his due, with photos and facts so next time you go to Galveston and see the gulls and shorebirds, you will wonder "Was that a Willet?". So, here we are. A medium sized stocky shorebird with a straight bill, gray legs and mostly gray-brown plumage. Late in the evening you might see a group getting ready for darkness, but during the day solitary Willets are common. They do hang out with other shorebirds, and are not as skittish as some. They are larger than most of the scurrying sandpipers. Willets eat crabs, worms and other delicacies they can find in the sand or mudflats. Or in the rocks. Willets are usually approachable, and don't seem to be spooked by humans. Often it seems they are interested in the attention of the camera; in fact, more than once I have had a shot ruined by a photobombing Willet. The plain gray-brown bird does have one distinctive attribute in his dark underwings, visible in flight and when he raises his wings. I have some in flight, but none I want to share. Still working on that one. I see Willets at Surfside, Quintana, Galveston, Texas City and most anywhere there is salt or brackish water. There are two races of Willets, Eastern and Western which some think might be sub-species. This article is quiet informative if you want to get into the details. Suffice to say Eastern Willets show up here to breed in March and then the adults leave for the Caribbean in summer followed by the juveniles. The Western Willets are here on the coast year round, but the breeding birds leave (non-breeders stay here) for the central plains and Canada in our Spring. And come back in the Summer. Must be an ornithological traffic director somewhere. This Willet was walking around Surfside last March in his breeding colors. Nice brown mottled pattern, a welcome relief from all that plain gray-brown of winter. A few weeks later we saw a male strutting around looking for a female... which he evidently found. He followed her around shaking his raised wings and making a lot of racket. A LOT of noise. And the female was not interested at all. She totally ignored his efforts. Might have been a bit early for her or she didn't think he was suitable. Last year we stopped by Anahuac National Wildlife Refuge after two days at High Island. This Willet had a fiddler crab and was pretty proud of it. He didn't run to the foliage, but hurriedly walked ahead of the truck in the road, glancing back at us now and then. Eventually, there was a wide spot and he veered off. I jumped out and got this shot. Willets can be cleaned up and made elegant. It takes a bit of post-processing, but I think he looks nice. I have to confess, I only take photos of Willets when there aren't more interesting subjects in the area. I found a lot of photos of Willets in my archives, so that shows there is always a lot of down time out hunting birds. Someday I will show you the American Coot photos I take when there are no interesting birds around in fresh water locations. So, what is going on with you? Do you think you could recognize a Willet now? Or is it still too cold to go outside? Let me know in the comments; I would love to hear from you.